Home Page | Questions & Answers | What is an affogato? When Miles Priestley answers questions about coffee, his eyes twinkle and his love of roasting coffee beans is evident. Watch Miles talk about his special way of making affogato for himself and his wife Tash. Today Teena Hughes asks: Hi Miles, I’m very keen to know what an affogato is? Good morning Teena. Affogato actually in Italian means drowned — is where they were going with that. The affogato is a scoop or a scoop and a half of vanilla icecream or gelato in a glass, with a shot or double shot of espresso over the top — hence the drowning of the icecream. Affogato is the sweetness of the icecream and the bitterness of the coffee – it just blends so well. Teena: Sounds fantastic! Now I have heard that you have a signature affogato — is that right? Miles: Oh yes! Quite decadent but very lovely. So the variation for us is that my wife and I love the icecream, we crunch up a Crunchy Bar (Australian candy), we sprinkle that over the icecream, then we pour the double shot of espresso over the top of the Crunchy Bar, and it just gives it that beautiful little crunchy twist. Teena: Oh yum that sounds great! Teena: You’ve got my mouth watering now! Thank you! 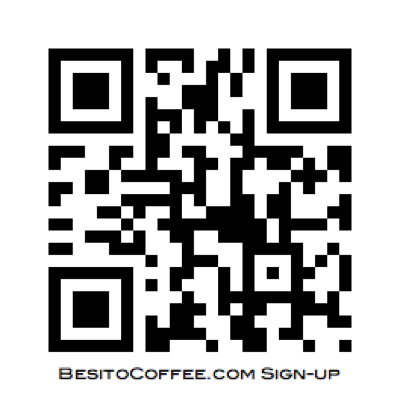 For a chance to win a bog of our coffee, pop over to our website http://besitocoffee.com – sign up for our newsletter and your name goes in the draw! Receive coffee tips and Early Bird notices of our new blends. We’d love to hear what you like about this type of coffee (especially made from Miles locally roasted coffee beans) – and his choice of Crunchy Bar on top — pop a note in the Comments below or chat with us on Facebook, Twitter, Pinterest or Youtube. See you soon!